Memorial Weekend has passed and as usual I ate entirely too much. There’s something about holidays and vacations that encourages people to eat, or maybe it’s just me. 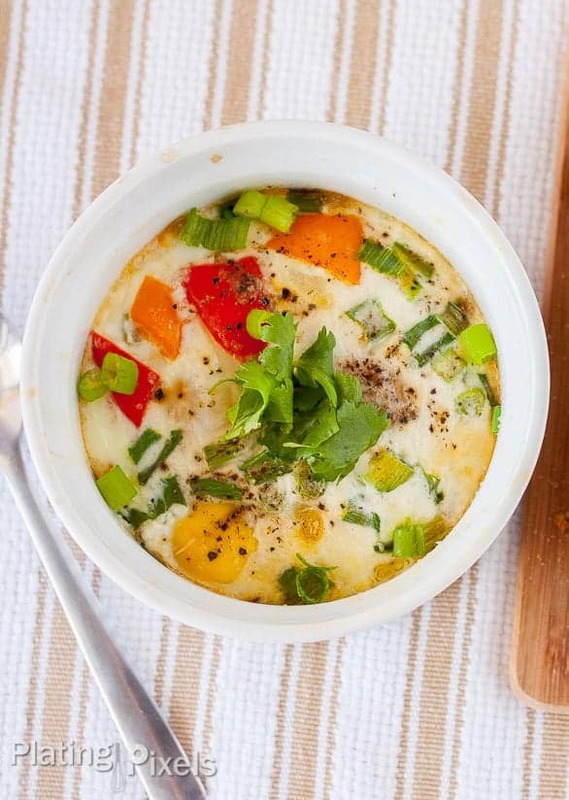 I love cooking and food, as in this Bell Pepper and Green Onion Healthy Egg Bake. Any excuse to absorb more than my comfortable allotment is welcome. To offset this beloved, yet sometimes unwholesome, passion I make sure to exercise regularly and eat healthy as often as possible. This way I don’t feel bad about the cheat meals, and actually welcome them with delightful excitement. This healthy egg bake is something you can feel good about, knowing that you’re offsetting your eating towards the healthy side (even if it’s one meal at a time, every bit helps). I adapted this from a recipe that didn’t contain any vegetables. Fresh, healthy vegetables add more flavor and nutrients to an otherwise egg only dish. 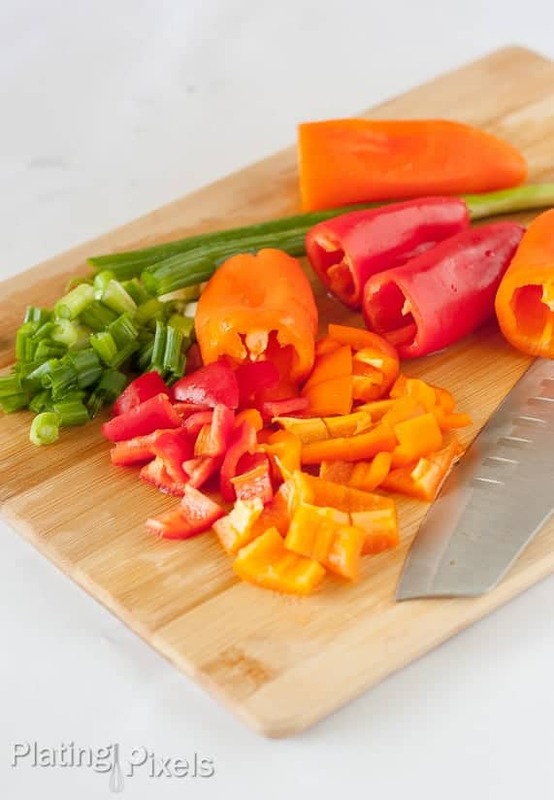 Red bell peppers and green onions give a nice crunch and summery spiciness. Add other vegetables like mushrooms or tomatoes if you want to expand this dish even more. A bit of whipping cream on top keeps the egg whites moist while baking. Submerging the ramekins in water ensures they cook evenly and all the way through. Once baked these will be firm, similar to a quiche. Don’t skip these simple but important steps. Modify recipe measurements depending on the size of ramekins or dish you use, and how many you want to make. As long as you have a layer of chopped vegetables on the bottom and fill with desired amount of eggs, topped with cream, you’ll have a quick and healthy egg bake meal you can enjoy anytime. For other healthy recipe ideas check out my Strawberry Mint Parfait or Blueberry Oatmeal Muffins with Lime Zest. Water in half and half boils and makes steam as it cooks, fluffing up the eggs. It also protects the top of the eggs, keeping them soft and moist. I shot this in natural light at 1/80 sec, f/ 4.0, ISO 800 . The photography needed to be simple, elegant and clean to represent the tone of this healthy recipe. The dish looked best complete in the ramekins, with the clearly recognizable vegetables that rose to the top during baking. A top-down shot beautifully shows the final dish, with cilantro and green onions for garnish. A slightly higher aperture keeps everything in sharp focus. Some toasted slices of bread on the side add to the scene and create a complete breakfast. The striped brown and white kitchen towel creates an even color balance. 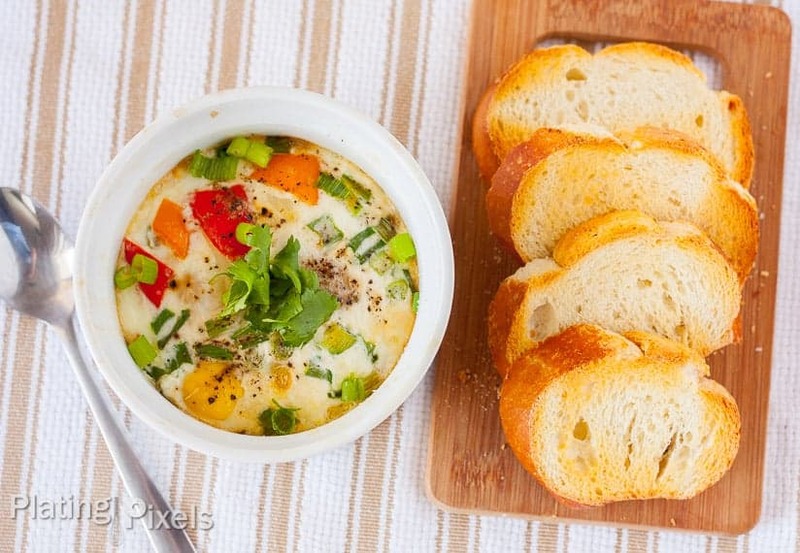 Fresh bell pepper and green onion healthy egg bakes. This breakfast recipe is fun and easy to make. Served in ramekins for a classy meal. Preheat oven to 350º F. Coat 4 small ramekins with butter. Divide and place cut bell peppers and green onions in bottom of each ramekin, about 1-inch layer. 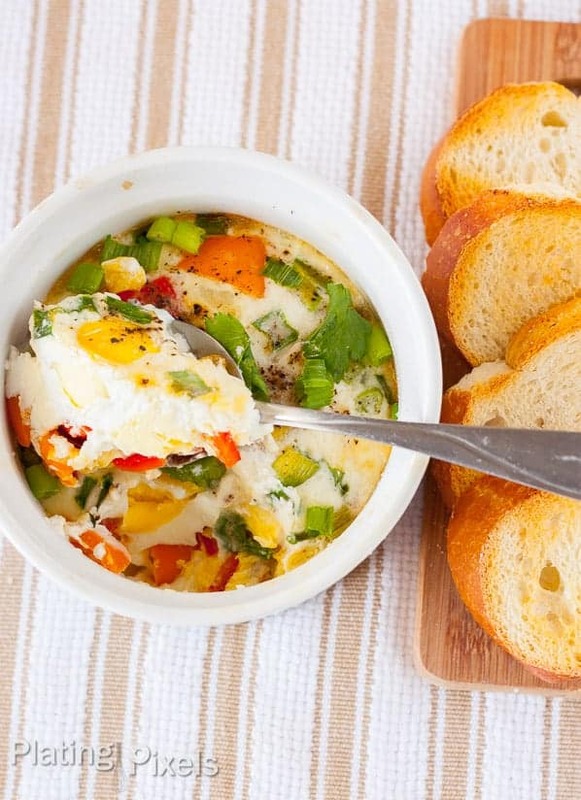 Top each ramekin with 2 eggs. Spoon 1 teaspoon cream over each. Then sprinkle with salt and pepper to taste. Fill 9x12 baking dish with about a 1-inch layer of water, then place ramekin (sides should be mostly submerged). Bake at 350º for 20-25 minutes, or until eggs are set and firm in middle. Cool slightly and top each with fresh cilantro as garnish. – Recipe adapted from CookingLight: The Complete Quick Cook. 2011. Print. – If you do not have ramekins you can use similar smaller baking dishes. Or use a small loaf pan and make one larger bake, then cut and serve smaller portions. I love baked eggs this time of year when things are cooling down, perfect with a good cup of coffee. They are hearty and comforting. I wish I had that pairing right now. Baked eggs are a favorite breakfast of mine. So simple! This version looks super tasty. Agreed Brandon. There’s something special about making a baked egg dish. This looks so scrumptious! I totally want to spoon this over those toast slices! Mmm that sounds perfect right now. Thanks Anita!